It is with great pleasure we write today to announce our very first VRScout Art Show. We’ve been working for months to assemble a dream team of partners to bring VR to the creative community in LA. You be the judge, but we think we nailed it. 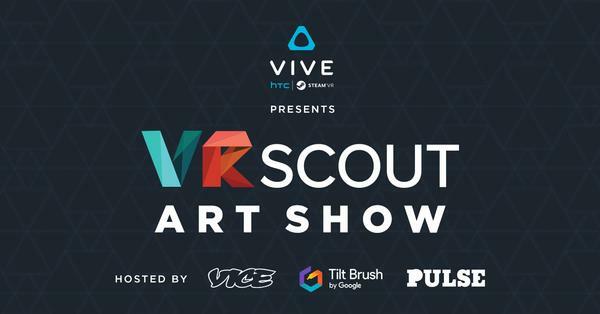 Presented by HTC Vive, the VRScout Art Show will feature a VR art gallery, live Tilt Brush performances by renowned LA artists, Google Cardboard crafts, food, booze, and a night of art like none other. The event will be hosted by Vice Media and sister company Pulse Films at their offices in Venice Beach. They were the first of the bunch to buy in on our crazy idea and it has been a blast to introduce their teams to VR for the first time. More on that to come. We have been working with Google’s Tilt Brush team to assemble our lineup of performing artists for the event. So far, they include Chris Prynoski and Antonio Canobbio of Titmouse Animation, ArtMobb, James Haunt, and Tim Biskup. Stay tuned. We’ll be announcing more artists over the course of the next week. For the art gallery, we’ll be featuring five outdoor HTC Vive stations with art-centered experiences by some of the top creators in the space, as well as a Google Cardboard craft station where some of our exhibitors will be giving hands-on walk-throughs of their mobile VR pieces. As if that isn’t enough to get excited about, rumor has it attendees might get a sneak peek at the consumer version of the new HTC Vive. Go to the VRScout Art Show event page to claim your spot. It is a free event, but there are a very limited number of general admission tickets available. If you aren’t able to get a ticket, make sure to join the waitlist. Our sponsors and partners will be giving away tickets to members on the waitlist leading up to the event. You can’t throw a party without friends. We’re beyond grateful for all the people who have come together to make this happen. Show them some love.